It is nearly a year since the announcement of changes to the driving test which would involve learner drivers to be able to practise on the motorway. Since June of this year, provisional licence holders have been allowed to drive on the motorway, following a change to the Highway Code. This month we take a look at what the change to Rule 253 means and use the opportunity for a quick refresh of motorway driving to keep skills sharp and knowledge fully up to date. An addition has been made to this rule stating that provisional licence holders are allowed to drive on the motorway as long as they are under the supervision of an approved driving instructor and bear red L plates. The car must also be fitted with dual controls. This change came into effect on the 4th June 2018. This change was introduced to enable student drivers to practise driving on the motorway as this forms a significant element of driving experience for many drivers, new and seasoned. Until recently, motorway driving lessons were not permitted until after passing the driving test, which cut out a large proportion of potential road experience for many drivers. 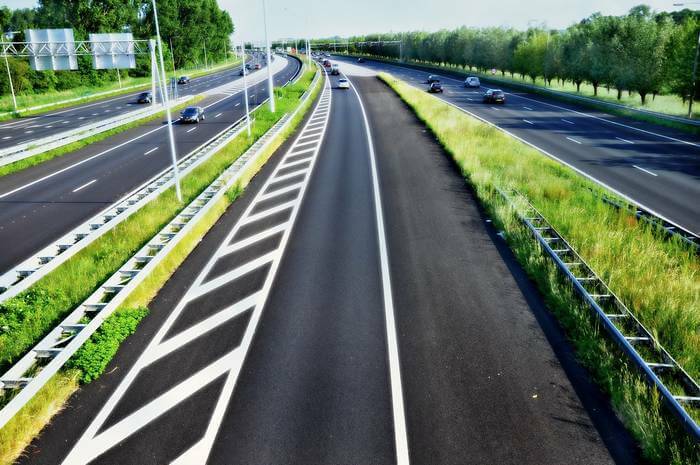 Why is motorway driving different? Mirrors become even more important on a motorway. This is because the speed at which vehicles travel means that there is less time to react to any situation, so greater awareness of what is happening around you is even more important. On joining the motorway, use the slip road to increase your speed so that it is closer to that of vehicles already on it. Join the motorway by signalling right and merging with traffic as soon as you can. Solid white lines mean that they should not be crossed so stay in lane until you are allowed to move across. Similarly, use the exit slip road to reduce your speed as you come off. Keeping your distance from the vehicle in front is crucial to being able to react in an emergency. Maintain a distance of two chevrons (or equivalent) in dry conditions and increase that in wet, icy, or foggy weather. Remember that the speed limit is a maximum of 70 miles per hour and be alert to changes in the speed limit to account for accidents, a greater volume of traffic, or road works. Never stop on the hard shoulder, carriageway, slip road, or central reservation unless it is an emergency or you have been instructed to do so by the police, emergency signs, or flashing red signals. Overtake only after you have checked your mirrors and your blind spot and ensured that it is safe to do so. Keep an eye out for motorcyclists who may not be as easily visible as larger vehicles. If you have any questions about motorway driving or would like a refresher course get in touch with our team at Lanes School of Driving. We have been helping motorists get on to and stay safe on the roads for over 100 years. All you need to do is call us on 020 8166 5678 for a chat and we can take it from there.